Last week, I shared 6 tips to simplify meal planning — because even though meal planning does save a bunch of time, money, and stress, I know first-hand that Summer is definitely not the most fun time to meal plan. I’ve slacked off a little this past month — but I’m getting back on track with a whole bunch of super simple meals that don’t even require recipes (my favorite way to cook). One of the meals that has shown up on our meal plan a few times already this summer is Baked Potatoes. Dave and I are huge potato fans — we like them in all forms (mashed, boiled, baked, fried, deep fried, etc. etc.) And since potatoes are one of the very few things Nora will actually eat, we eat potatoes A LOT. Nora’s favorite is mashed potatoes, but Dave and I are pretty big on baked potatoes — specifically loaded baked potatoes. As I’ve mentioned in the past, we really enjoy leftovers, and baked potatoes are one of our favorite leftover foods. I usually cook up 8 or more at a time so we can eat the leftovers for lunch or as a sidedish for another meal later in the week. Best of all, Russet Potatoes (the type I almost always use) are extremely inexpensive — usually less than $2 for a 10 pound bag! The most traditional way to bake potatoes is in the oven… but there are many other no-oven-required recipes, perfect for hot summer days. 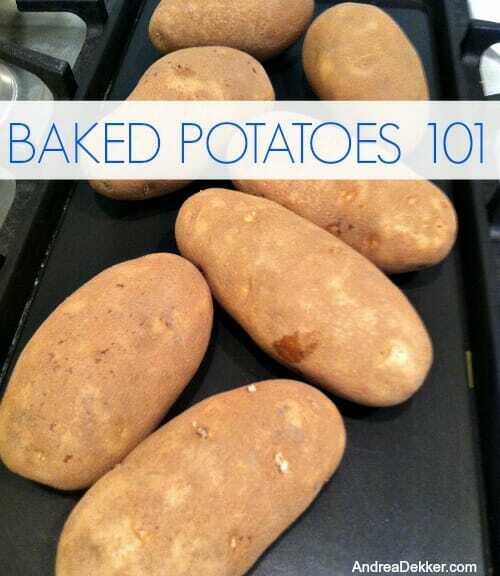 Our favorite way to make baked potatoes. Scrub potato skins and rinse. Prick potato with a fork several times. Rub skins with oil and sprinkle with salt. Place on a shallow baking sheet/pan (I cover mine with tin foil). Great for hot summer days or when you don’t have access to an oven. Place in a slow cooker (you can stack them if necessary) and cover. Wrap potato in a double layer of aluminum foil. Burry potatoes in the hot fire coals and cook for 30-60 minutes. Perfect if you already have the grill going — and much quicker than some of the other grilled recipes I’ve seen. Cook potatoes in the microwave until almost done. Cut potatoes in half and rub cut size with olive oil, salt, and peper. Grill over medium heat for 8-10 minutes or until potatoes are very soft and have nice grill marks. So as you can see, there are many, many ways you can work baked potatoes (and the leftovers) into your weekly menu plans. It’s such a simple meal, it’s very customizable based on your family’s taste buds, and you can make them almost anywhere! What are your favorite ways to eat a baked potato? Pizza Sammies: A Recipe from Dave! I personally don’t wrap my slow cooker baked potatoes in foil — but I do rub them with vegetable oil and sprinkle salt over top. They’ve always turned out fine for me! Thank you for the potato recipes! We LOVE potato in any form, too! Question – Do you need any amount of water in the slow cooker to cook the potatoes? In fact, do you always have to use water when using the slow cooker to cook anything? I don’t use water when I cook potatoes in the slow cooker — however I can’t say you “never” or “always” have to use water. It would just depend on what the specific recipe calls for I guess. This is not about potatoes, but I wanted to thank you. I tried your pest-free tip of using a Bounce dryer sheet in my pocket when I weeded and it worked !! Thank you so much. 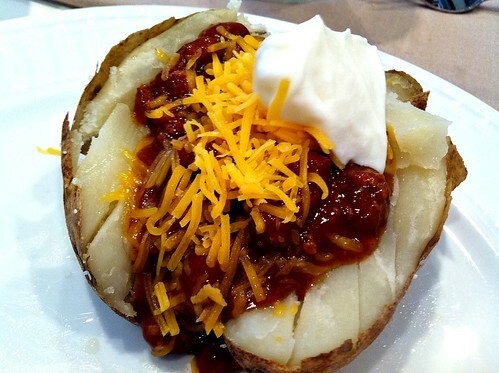 Baked potato with taco meat–that sounds pretty yummy! Will have to try. My husband is obsessed with potatoes and tacos. Maybe he’d like them together? My favorite way to eat potatoes right now is to scrub them, slice them longways, then slice each half into 3 or 4 wedges, depending on the size of the potato. Bake at 425 for 10-12 minutes. It’s faster than waiting on a whole baked potatoes and a super fast, easy side for almost any meal. I usually boil potatoes when we make them. They never come out dry and they taste just like baked. It’s faster than the oven and tastier than the microwave. Andrea, have you made baked potatoes in the slow cooker before using the method you describe? We are doing a big camping trip this weekend and I was going to do a baked potato bar for one of the meals, but the recipe I have recommends wrapping them in foil before putting them in the slow cooker. If I don’t have to do that, I’d rather not! Yes, I’ve made potatoes in the slow cooker with no aluminum foil many times and they always turn out fine. Love…love…LOVE potatoes!!! Thank goodness I’ m from Idaho! We make ‘Idaho haystacks’ a lot…bake your potato…pile it with ground beef or chili, then top with lettuce, tomatoes, olives, cucumbers, cheeses, what ever really…then finish off with ranch :). We also love Red potatoes,favorite way with them is to cut them into edges…mix with olive oil, parm cheese, garlic powder, and salt and pepper. Put on a cookie sheet and bake @350 until tender…yummy! Andrea, do you ever make Sloppy Joe’s for dinner? (with canned Manwich or homemade?) It’s inexpensive AND with just 2 of us, makes enough for leftovers. I love the sloppy joe meat on a baked potato with a slice of american cheese and sour cream. If you have onion chip dip in the house, that is even better that sour cream! So delish. Mmm, now I want baked potatoes for dinner. I scrub, prick, and microwave my Russets on high for ten minutes, then rub them with oil and salt and pop them in a 500 degree oven for ten minutes right on the rack. You just have to make sure the oil is rubbed in well and won’t drip on the coils. They are SO good, and it’s quick when I don’t have time for full-on oven baking. We love potatoes, too! We like baked potatoes with mushrooms and cream, or with bacon and cream on top. I LOVE potatoes but unfortunately i’m not supposed to eat them 🙁 but I still do sometimes. French fries (homemade baked in the oven), scalloped, bakes, mashed… all ways are delicious! and more. Potatoes are a cheap and easy way to balance out a meal. 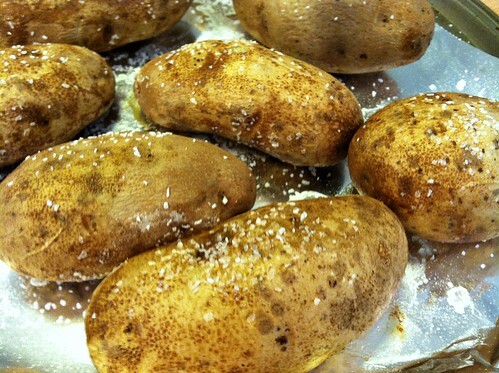 Thanks for sharing your baked potato tips and ideas. Hope you have a wonderful day! I cut up our leftover baked potato and pork tenderloin and fried them in coconut oil until crispy and had fresh green beans with a little butter, Parmesan cheese and sliced almonds. Our favorite!